Mooredale Day Camp is proud to be accredited by the Ontario Camps Association. The OCA works to preserve, promote and enhance the camp experience for children and adults. Mooredale Day Camp has voluntarily submitted to an independent appraisal completed by camp experts and has met up to 300 health, safety and quality program standards, from staff qualifications and training to emergency management. 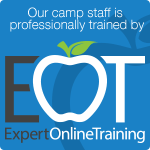 OCA Accreditation is a parent's best evidence of a camp's commitment to health and safety. Are you looking for a friendly, safe and welcoming place that is close to home and offers a variety of activities to challenge and inspire you children? Would you like us to take care of lunch and snacks every day? Do you want your child to take part in daily swimming lessons and a just-for-fun recreational swim? If you said 'yes', welcome to Mooredale Day Camp! Since 1968, Mooredale Day Camp has offered Rosedale, Moore Park and surrounding neighbourhoods a traditional, coed summer camp experience for campers 4 to 12 years old. The program is modeled around two-week sessions (with one week options) and is located in the heart of Rosedale, at the corner of Crescent Road and Mount Pleasant. We are proud to be an Accredited Camp of the Ontario Camps Association. Mooredale Day Camp operates out of a beautiful, historic mansion built in 1902 which includes in-door air conditioned spaces, a large outdoor playground, and our own heated and fully staffed outdoor pool. In addition, MDC accesses a variety of local parks and facilities for its programs. Mooredale is operated by the Rosedale-Moore Park Association. Participants in Mooredale Day Camp must be current members of the RMPA - details on membership can be found here. Membership is $125/year per family. Each Section is led by a Section Director and a Section Program Director who are responsible for preparing activities and supporting counselling staff wherever needed. In addition, Assistant Counsellors are placed with cabin groups to assist Counsellors, help run activities and to lead campers. Each day campers will participate in group activities throughout the morning. During the morning activity times campers will participate in swimming lessons based on the Red Cross curriculum and taught by the Mooredale Pool Club Instructors. Before lunch, everyone participates in a 25 minute free swim. That's right - we swim twice per day! Lunch is delivered hot and fresh and eaten outside under the shade trees. Campers participate in a daily rotation of afternoon activities until we all gather for "Round-Up" to close out the day. Mooredale Day Camp offers our Intermediate and Senior campers the choice between several specialty options. These specialties last for 1/2 day and allow campers to spend more time . See the Intermediate Camp section and Senior Camp section page for full details of the different options available! Our enthusiastic staff range in age from 15 to 29 and cumulatively have many, many years of camp experience. Our Assistant Counsellors are 15 years and older; Counsellors are 17 years and older; Specialty Staff and Senior Camp Leadership Team are a minimum of 18 years of age and have a minimum 2 years of camp experience. All of our Counsellors have a strong interest in children and their development, and demonstrate this through their dedicated care of the campers. Some of our staff have more than 10 years of experience, while others are just beginning in the exciting world of day camps for children. All of our staff have camp nicknames and are known only by these names at camp. Complete Mooredale's extensive one week, pre-camp training program. Are hired and evaluated based on the following 5 key areas: Love working with children, Creativity, Maturity & Responsibility, Optimism and Friendliness.